Each 4 1/4" x 3/4" x 3/4" fall wine stopper has a sturdy metal core lined with a black rubber stopper rim topped with a stylishly-tilted leaf silhouette. 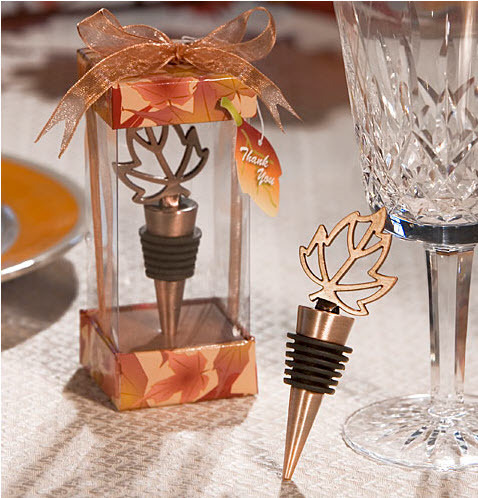 Each bronze metal wine fall leaf stopper is packaged upright in a deluxe clear box with a fall design top and bottom allowing a 360 degree view of the favor. The packaging is finished with a sparkling bronze organza bow and a designer leaf shaped thank you tag attached.